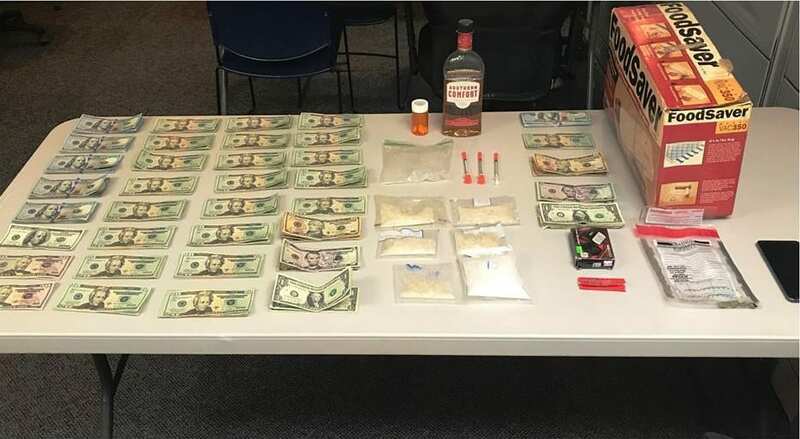 ELLIJAY, Ga. – Gilmer authorities are reporting today that a routine traffic stop led to much more as officers and a K-9 unit discovored almost a quarter of kilo of what they suspect to be Methamphetamine. Officers have taken two men into custody earlier this week when officials say that officers noticed the truck, turned on their lights, and proceeded to follow the vehicle before finally getting it to stop. On Tuesday, March 19, 2019, at approximately 1937 hours, Deputies from the Gilmer County Sheriff’s Office attempted to stop a green Ford Ranger for an expired tag, defective equipment, busted windshield, and tire requirements on Mountaintown Road. The green Ford Ranger failed to stop for Deputies and threw a brown plastic grocery bag out of the vehicle. Once Deputies got the vehicle stopped, Mr. Richard Drennon Sanford, age 63, and Mr. Charles Leon Hollifield, age 53, were taken into custody. Deputies then deployed a K-9 for an open air sniff of the vehicle. The K-9 alerted on the vehicle. A probable cause search of the vehicle revealed the following: a clear plastic Ziploc bag containing a white crystal substance (suspected methamphetamine), a set of black digital scales with residue, hypodermic syringes, a food vacuum sealer with vacuum sealing bags that were cut. A search incident to arrest of the suspects revealed that Mr. Sanford had $7,413 in U.S. currency, and Mr. Hollifield had a small amount of marijuana along with $998 in U.S. currency. The Gilmer County Sheriff’s Office seized the $8,411 in U.S. currency. Deputies conducted a search of the area and recovered the brown plastic grocery bag that was thrown from the vehicle. The bag contained six vacuumed-sealed bags containing a white crystal substance (suspected methamphetamine) that weighted approximately 223.4 grams (7.880 oz.’s). Mr. Sanford is charged with the following: V.G.C.S.A. Trafficking (Methamphetamines), V.G.C.S.A. with Intent to Distribute (Methamphetamines), V.G.C.S.A. (Methamphetamines), Drug E Related Objects, No Seat Belt, Expired Tag, Defective Equipment, Littering, Tampering with Evidence, Open Container of Alcohol, Fleeing and Attempting to Elude, Reckless Driving, and Driving on the wrong side of the road. Mr. Hollifield is charged with the following: V.G.C.S.A. Trafficking (Methamphetamines), V.G.C.S.A. with Intent to Distribute (Methamphetamines), V.G.C.S.A. (Methamphetamines), Drug Related Objects, No Seat Belt, Littering, Tampering with Evidence, and Possession of Marijuana less than 1 oz.